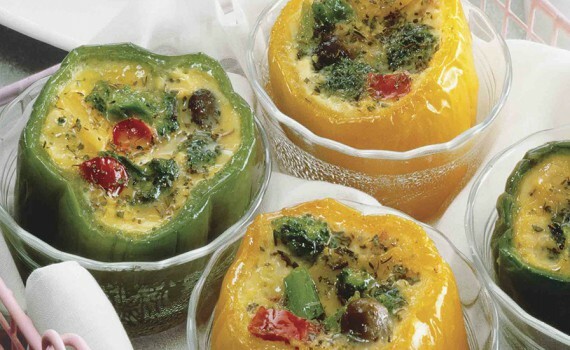 Bring some color to the table with these easy to make stuffed peppers filled with egg, broccoli florets and Italian seasonings. HEAT oven to 325°F. CUT about 1/2 inch off tops of peppers; remove seeds. PLACE peppers upright in custard cups; place cups in baking pan. SPOON 1/4 cup broccoli into each pepper. BEAT eggs, milk, garlic powder and Italian seasoning in medium bowl until blended. POUR evenly over broccoli. BAKE in center of 325°F oven until knife inserted near center comes out clean, 60 to 70 minutes. LET STAND 5 minutes. © Copyright 2019 - Dakota Layers. All Rights Reserved.